This is another Jogging Map which my friend Pat has collected during her travels. This map is from the Westin Xi’an in China. 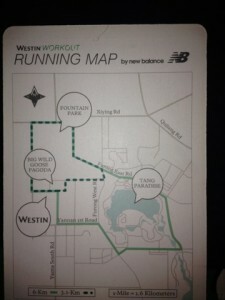 It was created for Westin Workout by New Balance. I like the simplicity of the map, and that it points out the nearby sites, including the Fountain Park, the Big Wild Goose Pagoda and Tang Paradise. Two routes are outlined, a 3.1 km route and a 6km route. Xi’an is most famous for its Terracotta Warriors. I saw the exhibit in New York City, but I can imagine how wonderful it must be to see the exhibit in its real home setting. Please send your Jogging Maps to Will Run For Miles!! A trip to Xian is worthwhile to see the terra cotta warriors. The site is big, much larger than you might expect from seeing just a few (or a few dozen) warriors on display elsewhere.